Why are Hawaiian women farmers taking off their clothes for Kona coffee? They’re helping the Kona Coffee Farmers Association, a nonprofit organization, raise money and awareness about Kona coffee. 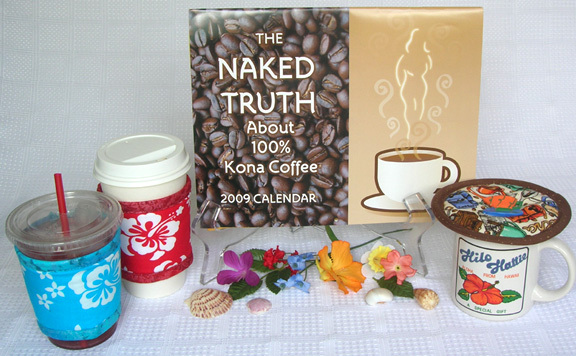 The women farmers are models for "The Naked Truth about 100% Kona Coffee" 2009 calendars. Each month you’ll meet a woman farmer demonstrating one of the farming tasks in growing coffee on her farm. The women are tastefully posed in beautiful Hawaiian scenery but you won’t see any Hawaiian clothing! 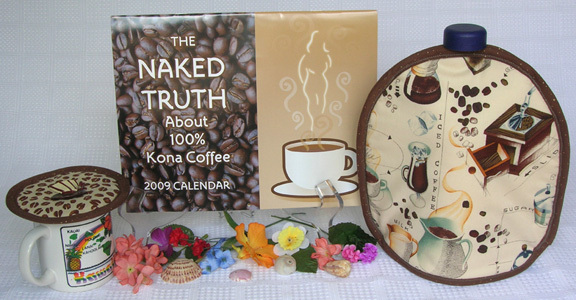 For the upcoming holidays, put a calendar with a Koffee Kozee (French press coffee cozy), a Kup Kap (cup lid), a French press, and a pound of Smithfarms 100% Kona coffee beans to make a unique gift collection. When you add a calendar, you’re also helping USA coffee farmers! These "calendar girls" do know beans about farming!